How to apply: Since the area around your nose gets oily quickly, Dedivanovic recommends using an oil-free cream concealer, which "will provide heavier coverage. As you get oily during the day, concealer darkens so you want to use a concealer that has a dry consistency," he says. We recommend Bobbi Brown Creamy Concealer, $23. Use your ring finger to pat and blend the concealer into the crease around the nose. 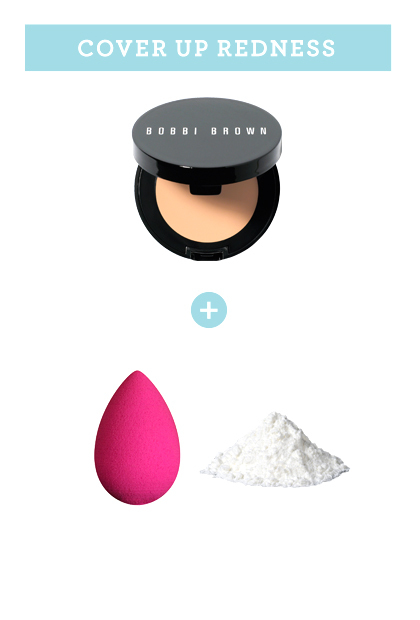 Then take your damp makeup sponge, dip in loose powder, and blend. Try Physician's Formula Mineral Wear Talc-Free Airbrushing Loose Powder SPF 30, $13.95 Dedivanovic says this is important, because "a lot of times the foundation and concealer are two different products with different finishes, so you have to blend the two together."